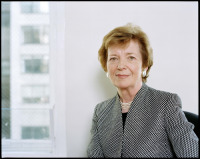 January 23 – Mary Robinson: CLIMATE JUSTICE: HOPE, RESILIENCE & THE FIGHT FOR A SUSTAINABLE FUTURE – 12:30 p.m.
Mary Robinson first rose to international prominence as President of Ireland from 1990-97. She is widely regarded as a groundbreaking and transformational leader who elevated the public role of the Irish presidency, helping to shape modern Ireland in a period of rapid and unprecedented economic growth. From 1997-2002, Robinson served as United Nations High Commissioner for Human Rights, also transforming that office through highly visible public advocacy. She is a founding member of The Elders, an independent group of global leaders formed by Nelson Mandela to tackle the world’s most pressing problems and leads The Mary Robinson Foundation – Climate Justice. Earning consistent praise as an unforgettable keynote speaker, President Robinson brings the thought leadership of a former head of state, a grandmother’s passionately felt concern for the future and the compelling stories of the thousands she has met traveling the world as a champion for climate justice, human rights, gender equality, and corporate responsibility. Known for touching hearts, expanding mindsets and sparking meaningful conversation, Mary Robinson frames humanity’s most daunting threat in highly solvable terms, leaving audiences hopeful and inspired to change the course of our planet’s future. January 25 - Jason Bishop: Straight Up Magic - 7:30 p.m.
As America’s hottest illusionist, Jason Bishop might read your mind one second or make goldfish appear the next, he performs stunning, state of the art magic and illusions! Each show features amazing sleight of hand, exclusive grand illusions and even close-up magic projected onto huge screens. Jason was handpicked by LiveNation to perform with Ke$ha, Matt & Kim, Paramore, Weezer, Drake, and many other celebrities at multiple Bamboozle Festivals. His performance abilities have led him from L.A to NYC and Mexico to Sweden, as well as every state and many countries in-between. Jason has entertained celebrities like Jennifer Aniston and Bam Margera, who after seeing him perform said, “Jason Bishop is the best magician I’ve ever seen.” Bishop’s combination of modern music, fast paced magic, sleight of hand and audience participation have landed him in several notable venues, including Celebrity & Disney Cruise lines, Hollywood’s Magic Castle and the U.S. Naval Academy at Annapolis. He was also named APCA’s Best Performing Artist of the Year. Click here to purchase tickets! $17.50 Adults, $5.00 Children under 18. Main Stage. Reserved seating. 7:30 p.m.